Both the Jaguar I bought and its corresponding section on the site have laid dormant for far too long. Just as in my youth, I got very excited about Alien vs Predator, and then quickly forgot about the rest of the system (but hey, so did the market!) I’ve finally felt mildly ashamed enough about this to take action, and the game I chose fortuitously turned out to be what I have heard referred to as the second-best game on the Jaguar. Just as with AvP, Tempest 2000 is a fine game, but we’re not quite up to “must own the system just for this title” status yet. 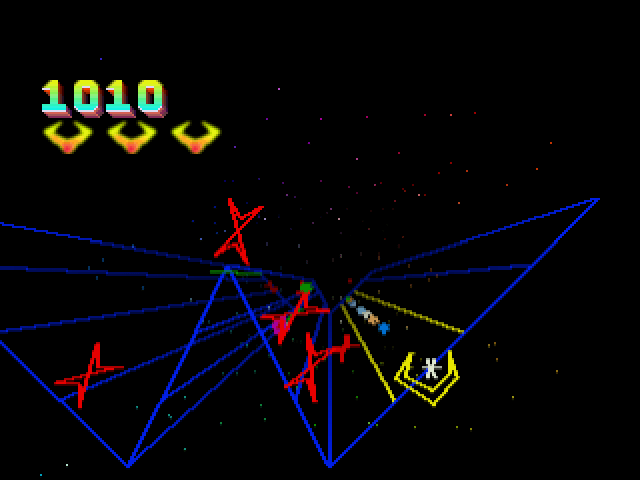 Tempest was a vector-based arcade shooter originally meant to clone Space Invaders, but instead ended up carving out its own memorable path. You control a claw-shaped craft as it rolls around the edges of stages composed of geometric shapes. These shapes are divided into lanes, and enemies travel down these lanes as if coming from the opposite end of a tunnel or a distant field. If you think of a 3D version of Tapper, you’re on the right track. Your claw ship must line up on a particular lane to shoot the bad guy coming down it, and you must quickly shuttle back and forth between lanes to prevent anyone from making it to your end. If they do, they will creep across the lanes toward you and do something nasty dependent on the enemy (like shock you or grab you). After you clear out a limited, but undisplayed, number of enemies, you will hyperspace to the next level. You fly into the level at this point, still picking lanes to travel down as you go. During the level, a green spiral enemy will be building long green spikes that you can whittle down for points – or for safety in this hyperspace section. If you pick a lane with an uncleared spike to hyperspace down, you will do some crashing. That’s the basic idea of Tempest. This version comes with four Tempest variants, and the first is a recreation of the original arcade version. The graphics maintain a mildly-updated vector look, with wireframe lanes and characters, and a zooming starfield in the background. Unlike the 80s computer ports of Tempest, the 3D effect here is convincing, smooth, and doesn’t feel like a flat screen reliant on optical illusions to give the appearance of depth. Tempest Plus is the second option, offering many of the updates from Tempest 2000 while maintaining the original wireframe look. Particle effects and a few of the new enemies are included, though the speed and difficulty seem about the same as the original. It would almost be a pointless addition, if it weren’t for the 2-player option only available here. It allows you and a friend to play the same level cooperatively. If you lack a friend, you can have an AI drone do the job just as well. Not only is it easier with two people covering the lanes, but it’s also pretty fun to take the levels on with a buddy. The AI Drone can hold its own as well, and is probably most helpful to novices getting a feel for the game. Tempest 2000 is meant to be the complete upgrade. The level boards and enemies are filled in with some snazzy shaded colors. It’s a bit superfluous, however, undeniably more colorful, attractive, and “trippy.” Extra particle effects add some pizzazz to the various explosions and gunfire, making weapons more visually interesting than the X’s and asterisks of the arcade, but are again unnecessary. The particles sometimes even work against you in small, cramped levels by masking approaching enemies. But the graphics are actually not the main addition of T2000. The real updates to the game are the new enemies, weapons, and the jump feature that all increase the already frenetic, tactical nature of the game. More than anything, these new features are what will make the 2000 model the last version of Tempest you will ever need to play. The last mode is Tempest Duel. As the name implies, you face off against a friend positioned at the other end of the playfield. Various powerups, objects, and occasional enemies make appearances and can be used to give you an advantage, but the basic objective will always be to “tag” the other player until they are out of lives. The trick here is that both players carry a mirror that reflects the other player’s shots. The mirror only lowers when that player is firing, so you have to catch your opponent when they’re trying to shoot at you, or have shots already in the air for the very moment they have to fend off an enemy. It’s a neat concept, but as you can imagine, these games can be long affairs. I enjoyed the co-op of Tempest Plus more, but I love the option of both. Tempest is ideal for the Jaguar’s three button setup. You rotate around the level shapes with left and right, and fire a stream of bullets with B. C releases your SuperZapper, which clears the screen of enemies and can be used once per level. In Tempest 2000, the A button fires your jump powerup when you collect it. You can only use it once per powerup, but your ship will leave the playfield and soar toward the screen; jumping “up” if you were looking at the level from the top-down. As enemies close in around you, you can jump out of their way and shoot them on the way down. It also allows you to shoot UFO’s who appear in this suggested open space between the monitor and the level itself. It’s a nice rethinking of the game area, and can be a lifesaver as well. 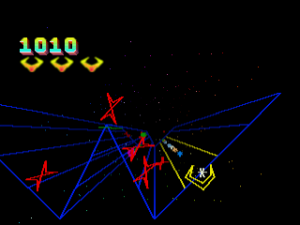 Tempest suffers the most from being a repetitive arcade game. There are 100 levels, comprised of 16 shapes that change their color set as the difficulty increases. The journey to 100 can be daunting, which is why this version includes a set of “keys” that you earn as you progress. Tempest will remember your progress after level 17, if you continue playing right away. Tempest 2000 will do the same, but stores your progress with your initials, and returns you to the last odd-numbered level you played. This system drives up the value of the pack by actually making it possible to complete the game, and getting you excited about coming back for your next round of play. If nothing else, it’s a great way to turn a quarter-vaccuming arcade design into a thoughtful home port. Apparently, the game’s music was so popular at the time that you could order a CD from Atari’s phone store. It’s thumping techno with a futuristic style, and certainly doesn’t get old, but I couldn’t see myself listening to it outside of the game. I also didn’t notice it changing much, but that could have been because I was too focused on shooting the approaching baddies. 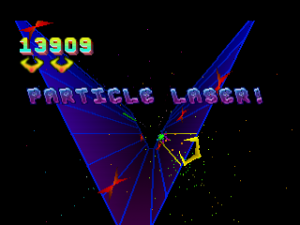 Effects for all laser blasts and explosions are crisp, and updated on the Tempest 2000 version as well. The metallic “tink” of the bowtie enemies as they creep along your edge of the tunnel probably makes no logical sense, but is especially nice, and adds some cold, mechanical menace to their approach. Some voice clips make it into the game, usually announcing powerups or status changes like a virtual commentator. They sound fine, but are mostly redundant. One of the best things about Tempest in general is how it can be fun for players of all skill types. 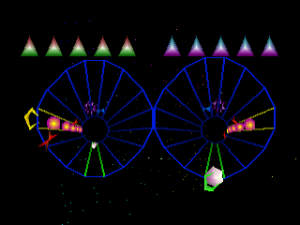 In the arcade, it was the first game to allow difficulty selection, by jumping ahead in the level list with a point modifier attached. The same system exists here. I also really like how, unlike every game that does this lane style, allowing enemies to reach your side of the tunnel doesn’t mean the end of the game. You can stick to your guns and often survive a swarm at the cost of missing some points and powerups. You may have messed up and lost potential points a more skilled player could have nabbed, but the game still goes on. New players won’t feel alienated by the first levels, and are more likely to stick around when things really start getting challenging. Once you get better, Tempest does a fantastic job of scaling skill and difficulty with you. It’s a great value for Tempest fans or newcomers. There are enough free versions of the game online (one even on Atari’s website) to give you a general idea of how the game plays. If you like what you see, then Tempest 2000 does its job of being the definitive version to get. The inclusion of the original Tempest makes for hours of great play on its own, and Tempest 2000 is just the kind of update/sequel fans will love. Plus and Duel do risk being forgotten, but their inclusion does drive up the overall value of the pack, and the co-op in Plus is a masterstroke addition. If you try Tempest and like it, Tempest 2000 makes a natural and enjoyable addition to any Jaguar library. Four versions of Tempest in one. Offers great arcade gameplay while being the most polished version around. One of those “if you only buy one version…” kind of comprehensive packs. Repetitive since it’s an arcade game, though this blow is considerably lessened with saved checkpoints. Sometimes a little overboard on the particle effects.